Wedding Officiant – If you are not holding your wedding at a church, synagogue, or other religious institution, you will most likely need to hire an officiant to perform the actual wedding ceremony. Music (ceremony and reception) – Most couples go right to the question of band vs. DJwhen they think about music, but make sure you don’t forget about the ceremony and cocktail hour! Many bands and DJs can provide additional speakers and set ups for this, but it’s also a great time to add in a jazz trio or string quartet! Photographer – This one’s pretty obvious, you’re gonna want a photographer! Florist – Even if you’re not planning on having floral centerpieces, it’s always a good idea to bring in a professional florist to take care of the personal flowers (bouquets, corsages, boutonnieres, etc.). If you have big dreams of doing your own fresh floral, please keep in mind that because of the nature of the living flowers, these projects can’t be done more than a day or so in advance. This is typically the time where most of our couples have family coming into town, have final beauty appointments, or are wrapping up other details. Adding in floral arranging can make those few days before the wedding unnecessarily stressful. Hair & Makeup – Most brides will choose to have professionals do their hair and makeup for their wedding day. Before you can secure them, you’ll need to decide on where you will have this done (in salon vs. house/hotel), and how many in the wedding party will need either or both services. Don’t forget those outside of the wedding party that might want to participate, like moms, grandmas, or siblings. Stationer (invites and other paper products) – What’s the point of having a party if you don’t tell anyone about it, right?!? Wedding planner – I’m obviously a bit biased here, but I truly do believe that having a profesisonal wedding planner on your team is the best sort of insurance you can have for your wedding. Having a planner involved from the beginning (before securing any venues or vendors) can ensure that you are looking at the right options for your style and budget. Many of our full service clients come to us AFTER booking their venue, and are already locked into pricing that may or may not work with their overall budget. A good planner will save you money in the long run, and will definitely save you from many stressful moments and planning headaches. If you are thinking of hiring a full service planner, they should be the very first thing that you book! ”Day Of” coordinator – While nothing beats the personal attention and help that you will get from a full service planner, I highly recommend considering a “Day Of Coordinator” at the very least. The name is quite decieving though, as no true professional can simply show up on the wedding day and be able to execute the event seemlessly. Most planners begin their Day Of services a month or two out, and will sit down with their couples a few times before the wedding date. They will be able to go through your wedding details, and suggest any adjustments or things that you may have overlooked. They will connect with all of your vendors, and make sure all of the behind the scenes details are taken care of before the wedding day. On the actual day, they will help to run the event, working with all of your vendors to bring it all together. I often refer to us as the “Team Captain” of the wedding vendors. Our role is to make sure everyone has what they need to make the day absolutely perfect! NOTE: Many locations have in-house coordinators, some even calling themselves Day Of Coordinators, but do not mistake this for having an outside planner involved in the wedding day. The venue coordinator is there as the point person for any venue and catering details for that day, but will most likely NOT be involved with the other vendors, wedding party, or other specific details that an outside planner would be there to cover for you. Many times they are covering other events happening at the venue that day, and will be taking other appointments and tours while they are there. Generally speaking, their focus will be divided that day, whereas an outside planner will be dedicated to your wedding alone, making sure nothing is missed! Videographer – I often hear that couples would love to have a videographer, but it’s just not in the budget. While I totally understand the need to stick to a budget, there’s nothing like being able to hear your vows, or relive your first dance on your anniversaries to come! Hiring a professional videographer is definitely an investment, but please do make sure to give it some consideration, and try to work things around in the budget, if possible. A quick side note of caution that I would pass along to all of my clients. Just like most categories in wedding vendors, videographers can vary wildly in the quality of their scope and work, and though it can be tempting to be attracted to a good deal, keep in mind that phrase “is it too good to be true”? 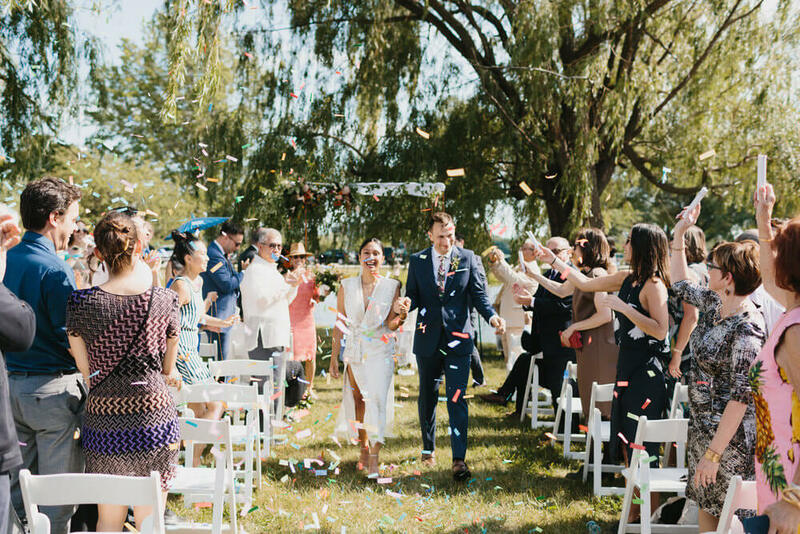 If you are working on a tight budget, but would like a video of the wedding, see if you can find an option for raw footage of the key moments, like the ceremony, toasts, and first dance. Much of the cost is in the editing, and if you can limit that, you can find a lower priced package. Make sure to review samples of the videographers work, and check out their references too. Cutting corners by hiring a cheap videographer (or photographer, for that matter) can often result in a less than desirable end product. Transportation – This is typically pretty cut and dry, and very dependant on the venues you’ve booked. If everything is in one location, you’re lucky enough to skip this category! If your ceremony and reception are in different locations, or if you want to take photos at on offsite location, you will most likely have to arrange for a limo or shuttle for at least the wedding party. If you have a significant number of guests that live out of town, it’s often a nice consideration to arrange for them to get from the hotel to the venue locations, as they are most likely not familiar with the area. If you’re looking to save money on transportation, see if you can find a hotel that offers complimentary shuttle services to/from your venue. Make sure to ask if it’s a shuttle dedicated to your guests only, or if it will be shared with other hotel guests. Also clarify the time that it runs through to make sure that it’s still avaialble at the end of the wedding to pick your guests up. Rentals – This is another category that is dependant on the venue that you’ve booked with. Most will have what we refer to as “house” items, meaning the tables, chairs, and linens that come with the space. If you’re at a more bare bones venue, you might be required to rent all of these items. Alternatively, some couples simply don’t like the house options, and will choose to rent items that fit their design or look better. Outside of the necessary tables, chairs, and linens, so other common items that couples will rent are charger plates (LINK), lounge furniture, dance floors, and draping. These are all optional, but can really change the overall feel of the event. Many rental companies will offer special rates if things are booked together, or at the very least, you’ll save on delivery/set up costs if you book rental items together. Often companies will offer items outside of what they are known for (for example, a linen company will ofter also rent chairs), so make sure to ask them about these products before booking with multiple vendors! Lighting – The most common wedding lighting used is the dance floor lighting that most often comes with the DJ or band that has been reserved. Make sure to clarify that they will provide this, as a dark dance floor is never fun! Uplighting is the next most common, and that is when lights are placed around the perimeter of the room flushing the walls with colored light. The most popular shade is “amber”, which is a soft candlelight color that gives most rooms a romantic glow. If you’d like something more vibrant, you can use uplighting to bring in pinks, purples, blues, or any other color you’d like. If you’d really like to transform the look of your space, lighting can make a huge differents. While dance floor lighting and uplights are the most common, chat with your lighting company about additional options, if this is your goal. Bistro lights, pinspotting, truss lighting, and stage lighting are not as common, but can also make a huge impact in the look of the venue, and can be a great addition, if budget allows! Photo booth – Photo booths started to become popular about 10 years ago, and are changing every season to remain on trend. While the traditional booths are still popular, many companies offer “open” concepts, live streaming, or other fun twists on the initial concept that include posting to social media and colleting the digital images for the couple to enjoy after the wedding. Another fun throwback that’s been trending recently is a “DIY” photo station with poloroid cameras. This allows your guests to take their own photos anywhere at the event, and they can incorporate these into a keepsake guest book.